/ Modified feb 19, 2018 2:03 p.m. Joins other retiring GOP lawmakers debating party's future direction. 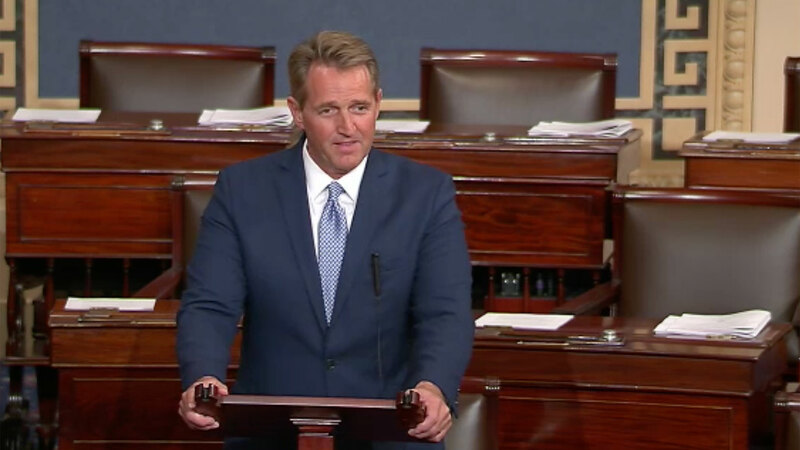 Republican Jeff Flake announces his retirement from the U. S. Senate October 24, 29017. Retiring U.S. Sen. Jeff Flake thinks the Republican party brand is turning away voters who could be key to its future. Flake joined a panel of fellow Republicans on CBS's "Face the Nation" on Sunday. All of them have announced they are departing Washington and leaving seats open for newcomers in the U.S. House and Senate. Flake said Republicans have failed to broaden the base that helped Donald Trump win the presidency, especially with minority and millennial voters. "Given the positions and the behavior that the President has exhibited, I think it makes it very difficult as young people to identify with the Republican party," he commented. Flake has been an outspoken critic of the Trump administration and its policies. He said Republicans are making a mistake by putting their loyalty to one man ahead of the best interests of the party and the country.